Growing up in the era of the NES and SNES, I have always had fond feelings for the action platformer genre. A lot of people must share the same nostalgia as action platformers are one of the most popular indie genres for video games. With so many games being created for this genre, for a game to stand out it has to offer something that hasn’t been seen in other games from the genre. This brings us to today’s game Fox n Forests. What initially drew me to the game was the idea of an action platformer where you could change the seasons with the press of a button. I was intrigued by the concept because I thought it could be used to create a truly unique action platformer. Fox n Forests is a fun action platformer that utilizes an interesting mechanic but relies on too much backtracking. We at Geeky Hobbies would like to thank Bonus Level Entertainment, EuroVideo Medien, and Independent Arts Software for the review copy of Fox n Forests used for this review. Other than receiving a free copy of the game to review, we at Geeky Hobbies received no other compensation for this review. In Fox n Forest you play as Rick the Fox. The forest that Rick lives in has been corrupted by evil forces. In pursuit of treasure Rick agrees to try and save the forest from the evil forces that are currently taking over the forest. Rick attempts to save the forest by collecting four corrupted pieces of bark from the spirit tree that oversees the forest that have gone missing. To help him on his journey he is given a magical crossbow that in addition to shooting magical arrows can change the season. Will Rick be able to save the forest in time? 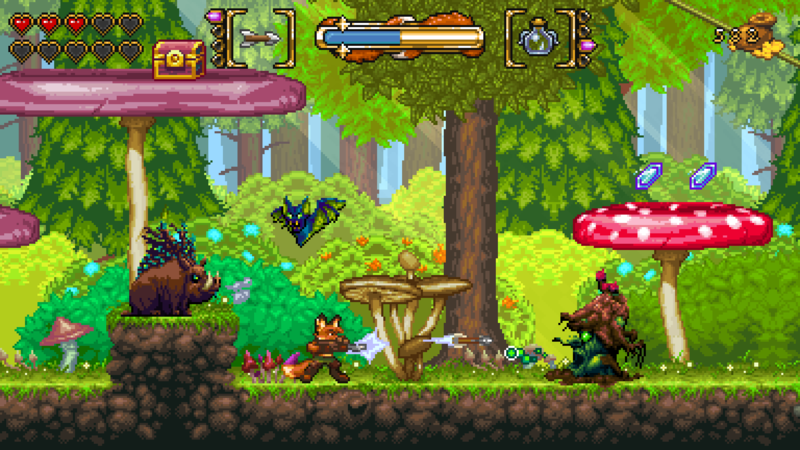 Basically Fox n Forests is your typical action platformer. Your goal in each level is to reach the end without dying. In your way are enemies that you have to defeat along with various platforming sections. If you are familiar with 2D action platformers you should already know what to expect out of Fox n Forests. Fox n Forests doesn’t drastically change anything from other games in this genre. You basically jump between platforms while killing enemies with melee and ranged attacks. There are also collectibles you can find along the way. While the main mechanics of the game are not particularly original, I still had fun with the game. I attribute this to a couple things. The main reason is that the game’s controls are well done. The controls are quite precise where you really can’t blame mistakes on the controls. For this type of game having tight controls is important so it really helps Fox n Forests. In addition to the controls, I actually found the level design to be pretty good. For this type of game the levels actually do a pretty good job adding verticality. Each of the levels contain multiple paths through the level. You can either take the low or high path (or both if you are looking for the collectibles). I think Fox n Forests also does a pretty good job with the game’s atmosphere. While the art style is not going to appeal to everyone, fans of the 16 bit era of video games should really appreciate the game’s art style. The game’s music is also reminiscent of that era including some pretty good chiptune songs. The game also likes to make fun of video game industry as the character at the checkpoints likes to make little quips about other video game franchises. The mechanic that I was most interested in Fox n Forests though was the seasons mechanic. Basically you are given the ability to change the current season with the press of a button. Each level has a default season and an alternative season. By pressing a button you activate the alternative season which is used to advance in levels as well as opening up new pathways. You have to be quick though as when the alternative season is engaged it drains your mana. So there are things that I liked and disliked about the season mechanic. What I like about the mechanic is that it is really easy to use as you just press one button to turn it on and off. The change is usually really quick even though there is a slight lag while the seasons are changing which could lead to you occasionally taking some hits from enemies. I also liked that the mechanic is not just a gimmick as you are required to change between the two seasons from time to time. The problem I had with the mechanic is that the game doesn’t utilize it as much as it probably should have. When the game utilizes the mechanic it is usually in a really obvious way. Outside of helping you acquire some of the collectibles, the game doesn’t use the mechanic as creatively as I would have hoped. I think the game could have added some interesting puzzle mechanics to the game by utilizing the different seasons to solve puzzles. The game never really uses the mechanic in this way though as the seasons are mostly just used to create platforms that you use in the platforming sections of the game. In addition to the seasons mechanic, I actually found the way that Fox n Forests handles checkpoints to be pretty clever. Basically each level in the game has quite a few checkpoints scattered throughout the level. In most of these type of games, when you cross the checkpoint it is automatically activated and you will automatically spawn at the checkpoint when you die. Fox n Forests handles things differently as all of the checkpoints in the game are optional. If you don’t activate a checkpoint you have to restart the level from the beginning or the last checkpoint you activated each time you die. This means that players that really want to challenge themselves can decide to play the levels using no checkpoints. The more interesting thing that comes from the checkpoint system is that the game charges you to use the checkpoints. Each time you want to activate a checkpoint you have to pay some coins. The further you progress in the level the more expensive each checkpoint becomes. The reason I found this to be interesting is that it kind of adds a press your luck mechanic to the game. You should be able to afford to pay for all of the checkpoints. There are two potential reasons why you might not want to though. By not using all of the checkpoints you can save some money which you can then use to purchase upgrades. The other reason why you might not want to use all of the checkpoints is that it tends to make the game pretty easy (at least on normal difficulty). Usually there isn’t a lot between each checkpoint. By using every checkpoint it kind of feels like when you save after every action in a game so you can go back if you mess up. By using every checkpoint there is little to lose when you end up dying that it takes some of the suspense out of the game. When you die you will usually only lose a minute or two of progress. With the checkpoints being optional though it actually does a pretty good job of allowing players to make the game as easy or difficult as they want. If you want the game to be easy feel free to activate every checkpoint. If you want more of a challenge though skip some or all of the checkpoints as there will then be more to lose when you die. I personally wouldn’t say the game is that difficult on normal difficulty even if you skip some of the checkpoints but if you were to play the levels without using any of the checkpoints I could see the game being quite a bit more difficult. While I liked playing Fox n Forests one thing that I hated about the game was the fact that the game basically forces you to backtrack. When you finish a world you need to have acquired a given number of seeds before you are able to unlock the next set of levels. If you haven’t found enough seeds, you are forced to repeat levels in order to find more seeds. In general I like the idea of having collectibles as it gives players the option of trying to collect all of them in each level. For completionists and people that really enjoy a game this adds content to the game as it gives them something else to do after they have completed the rest of the game. I hate it when games force you to collect a given number of collectibles before being able to proceed though. The main reason I hate forcing players to collect a given number of collectibles is that it usually feels like a way to pad the length of a game. I like gathering the collectibles that I can find my first time through a level but I am not the type of player that likes being forced to replay a level just to find more collectibles. If you are extremely thorough you might not have to replay levels in Fox n Forests. I wouldn’t bet on it though as the game forces you to collect 60% of the seeds to proceed in the game. You will likely have to repeat levels to get the necessary number of seeds for a couple reasons. First to get access to some of the seeds you will need to have unlocked specific upgrades for your crossbow. As you only get these upgrades as you progress through the game, it is impossible to get some of the seeds your first time through a level. The other reason why you likely won’t find all of the seeds your first time through the level is the fact that most of the seeds are hidden behind false walls and other hidden paths that are hard to find unless you check every nook and cranny. Unless you were planning on finding all of the collectibles anyway, you likely will end up wasting at least an hour or two going back to find the seeds you need in order to progress in the game. At this point I haven’t quite finished Fox n Forests. I have completed three of the worlds and based on how the game is set up I believe the game has a total of four worlds. Each world has two normal levels, a boss fight, and a bonus level which is unlocked if you find all of the seeds in the world. So far I have been playing the game for around 4-5 hours. If there isn’t an unexpected difficulty spike or an additional world I would guess that the game will take me another two hours or so to complete. Therefore I would guess that the game will take most people around 6-7 hours to complete. For this type of game I would say the length is not too bad. The problem is that at least one to two of those hours was spent replaying levels in order to get the necessary seeds in order to proceed in the game. I believe this supports my belief that the backtracking was added in order to pad the length of the game. Fox n Forests is a good but not great action platformer. If you like action platformers you will have fun with Fox n Forests. The controls are responsive and the gameplay is pretty fun. The game’s atmosphere is well done with graphics and music reminiscent of the 16 bit era. The one unique thing that Fox n Forests adds to the action platformer genre is the ability to change the seasons at any time. The mechanic works pretty well even though I think the game could have done more with it. I mostly had two main issues with Fox n Forests. Outside of the seasons mechanic, the game is not particularly original. The biggest problem though has to do with the fact that the game basically forces you to replay levels in order to collect seeds needed to advance to the next set of levels. My recommendation for Fox n Forests comes down to whether you like the 2d action platformer genre. If you don’t really care for the genre, the game doesn’t really do anything that will likely change your opinion. If you like the genre I think you will have fun playing Fox n Forests. Whether you should purchase the game right away or wait for a sale comes down to how much you are interested in the changing seasons mechanic. The changing seasons mechanic is an interesting addition to this genre of video games. The gameplay is fun and the controls are responsive. You are forced to repeat levels in order to collect seeds to proceed in the game. I think the game could have done more with the seasons mechanic.